When Andrew Vachss attended college he viewed it as "something to be endured, with little involvement, and even less personal investment." But the university recognized his potential, and refused to let him squander it. the realm of scholarship, public service and the performing arts." 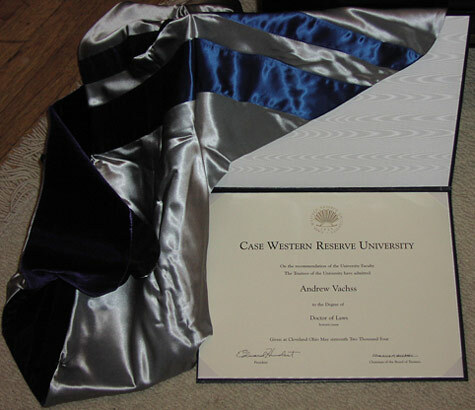 "If Case Western Reserve University didn't have an alumnus like Andrew Vachss, we would have found it necessary to invent him. He's a 1965 graduate and has gone on to compile a career that is almost literally beyond belief. It doesn't do justice to simply say that he's a 'lawyer, author and advocate for child protection and juvenile justice.' He has run a maximum-security juvenile detention facility. He almost lost his life as a relief aid troubleshooter in Biafra. He has been a grass-roots investigator of sexually transmitted diseases. But most importantly, Mr. Vachss has fully confronted the evil of child abuse—he calls it 'the Beast'—on a level that makes most of the rest of us highly uncomfortable, as it should. But we need to adopt a little of Mr. Vachss' courage—and not look away so quickly. "He writes prolifically, non-fiction as well as fiction, and is the author of the Burke series of novels. He is a lawyer, limiting his practice to representation of children and youth. Mr. Vachss puts forth the brilliantly simple proposition that child protection is inseparable from crime prevention." President Hundert presented Vachss with the diploma and ceremonial hood, which are pictured below. For more information on Case Western Reserve University, visit www.cwru.edu.